It wasn’t perfect. The coach still sees much work to do, but other than a rash of mystifying turnovers and missed free throws at the end, the No. 16 Ducks played some of their best basketball of the season in disposing of Washington 81-76 Saturday before a sellout crowd of 12,364 at Matthew Knight Arena. This team just wins. Now 18-2 for the season and 7-0 in the Pac-12, its trademark is to do whatever it takes to get the W. It wins without superstars or self-first types, just increasingly confident and hard-working players who like playing the game together. The Ducks winning ingredients against the Dawgs included playing moments of precise, fine-tuned basketball in the half court, as well as getting out and scoring in transition. The Ducks shot a sparkling 57.8% from the field as they overpowered Washington in the paint and scored 44 points inside. But the win also showed the ugly and the frustrating side of Oregon’s play as they committed 23 turnovers, and the Ducks and Huskies combined for 44. At one point in the first half, the two teams combined for eight turnovers in 12 possessions. The first half had four ties and six lead changes as Washington utilized 65% shooting from the field to make it a battle early. But the Ducks pulled away just before the intermission as senior Carlos Emory, who scored seven straight Oregon points, led the charge. His first two came on a monster dunk in transition, giving the Ducks a 30-28 lead. 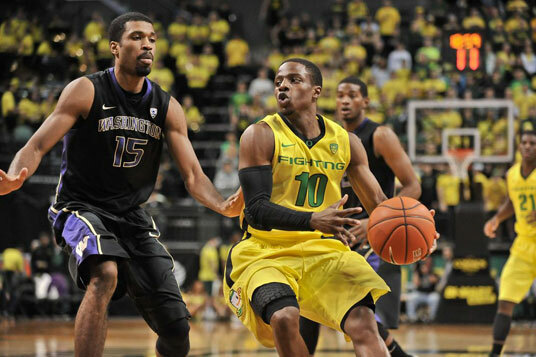 Washington would never lead again as Oregon stretched their advantage to 37-33 at the half. Oregon outrebounded the Huskies 30-24. Arsalan Kazemi led the way, his 11 boards along with 11 points gave him his fifth double-double of the season and the 50th of his career (including three seasons at Rice). The second half saw Oregon steadily pull away, as the Ducks built their lead to as much as 14 points with 7:23 left in the game. 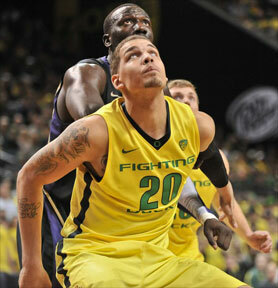 Leading to the Oregon surge was their use of full-court pressure, which got the Ducks some easy baskets. But just when it looked like Oregon could coast in for their 20th straight home win, enough missed free throws and turnovers at the end allowed the Dawgs to hang around and pull within four points twice in the final minute. 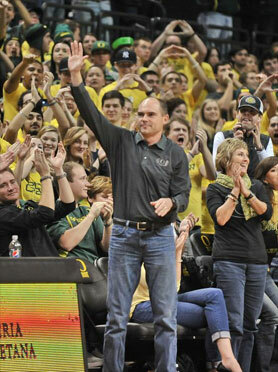 The largest crowd of the year at Matthew Knight Arena certainly enjoyed the show. Perhaps the loudest reaction from the crowd, other than Emory’s powerhouse first half dunk, was the introduction of new football coach Mark Helfrich during a second-half timeout. The players noticed the crowd. Singler said, “This was the best crowd since I’ve been here. I was really happy about it. It really got us going.”When the Ducks pulled away in the second half, the crowd was rocking. Singler had a stellar shooting performance for the Ducks. His 7 of 9 performance from the field contributed to his game-high 18 points. Emory joined Singler and Kazemi in double figures with 11 points. It is a team of expanding depth, as witnessed against the Huskies. Because freshman point guard Dominic Artis missed the game due to injury, junior Jonathan Loyd got the start and helped the Ducks to a quick 8-3 early advantage, playing a season-high 31 minutes. His ability to run the team at the point and his tenacity on defense was not surprising to his teammates. With the loss, Washington dropped to 12-8 and 4-3 in the Pac-12, and have now lost three straight games. Five Huskies finished in double figures, with Andrew Andrews leading the way with 15. Other than the coaching staff, this Oregon group has no one that has previously experienced the heady success that is presently surrounding this basketball team. These young Ducks are continuing to figure out what this league-leading business, the national attention, the winning streaks, and the uncharted territory is all about. Leading the conference by two games in late January has Eugene excited. However, as Altman reminded his team, “We’re not even halfway through.” A weekend in the Bay Area awaits. The Ducks historically have not had much success on this trip. With the Ducks learning as they go, the results have been the same. Not always pretty, but very effective. The next test comes next Wednesday night at Stanford.